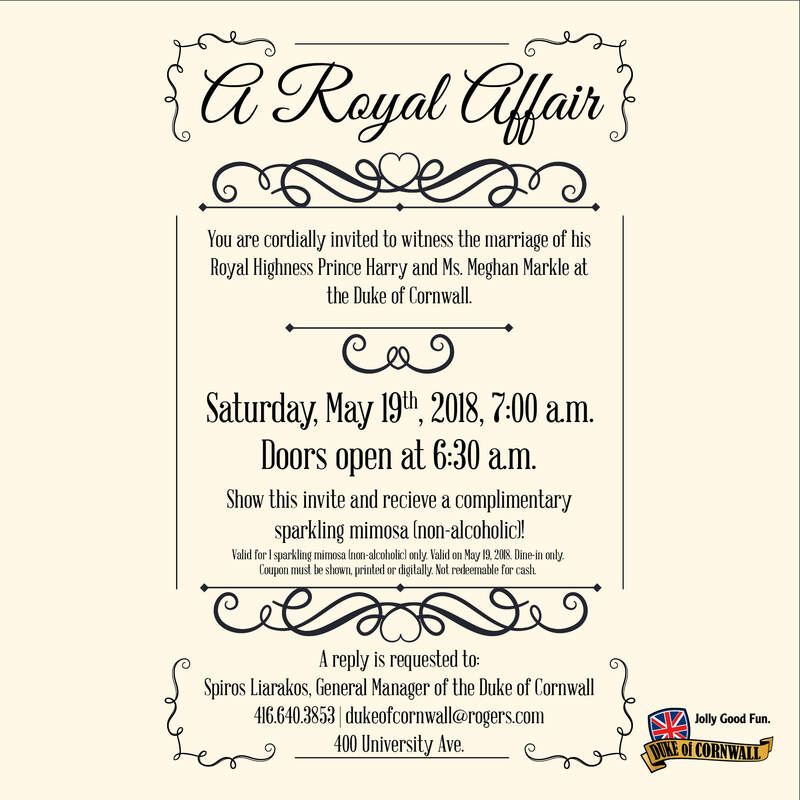 Where are you watching the Royal Wedding on May 19? The Royal Wedding of Prince Harry and Meghan Markle is taking place on Saturday, May 19 and — as it’s obviously a very special occasion — we’re covering some options of how to view it. Because of the UK time difference it’s an early start. The Duke Pubs reached out to let Brits in Toronto know that they are throwing a viewing party at the Duke of Cornwall with co-organizers the BCCTC, Loyal Societies and Typically Brit. Doors are opening at 6:30 a.m. and everyone is welcome to come and watch the wedding with them. And bonus points: Brits in Toronto readers can print and show this coupon for a COMPLIMENTARY (non-alcoholic) sparkling mimosa! You’re ‘aving a larf ain’t ya?! How good is that?! But wait — there’s more! The Duke’s early-morning grumbling chef will also be whipping up the Proper London Fully Loaded breakfast consisting of three eggs any style, banger, bacon, grilled tomato, potato pancakes, baked beans, multigrain toast and strawberry jam. A pure bargain at an honest $13.99. If none of the above takes your fancy and you prefer to watch the Royal Wedding in bed with a warm over-sweet cuppa char, then our new BFF BritBox is feting the nuptials in style, with the opportunity to watch ITV’s broadcast of the wedding celebration LIVE. The broadcast will be hosted by ITV’s own Phillip Schofield and Julie Etchingham, exclusively anchored from a specially constructed studio on the Long Walk in Windsor. ITV has put together a lineup of experts joined by a range of guests including those who know Prince Harry and Meghan, as well as friends of the Royal Family and live coverage from across the Globe — From St. George’s Chapel and Windsor Castle, to Lesotho in Africa, the home of the charity co-founded by Prince Harry. You’re ‘aving more of a larf ain’t ya?! How also good is that?! So, no excuse Brits in Toronto for missing out on the royal event of the year. This entry was posted in Uncategorized and tagged BritBox, brits in toronto, duke of cornwall, duke pubs, meghan markle, prince harry, royal wedding on May 4, 2018 by britsintoronto.